As a coder, should you add to your savings or pay off debt? Add it to your savings account? Put it towards your mortgage? Pay off your credit card debt? And the correct answer is… 4. As amazing as it feels to be able to put money in your savings or buy something new you should always pay off debt first. When we save we get paid interest on savings, HOWEVER the interest we pay on money we’ve borrowed almost always outweighs this. Student loans: Have such low interest that you shouldn’t rush to pay it off, especially if this means you may have to borrow more expensive credit later on. 1. Credit cards – If you have a 0% period on your credit card make sure you are paying enough each month to clear your debt before the interest kicks in. If you want to over-pay you can contact your card provider and ask to increase your monthly direct debit. 2. Loans – If you got your loan after February 2011 you are allowed to overpay by £8,000 in a 12 month period without being penalised. Some banks are still playing catch up with this law, if they do try and charge you direct them to section 94 of the Consumer Credit Act. You need to give the lender written notice (by email is fine) and then overpay within 28 days of giving the notice. The same rules apply if you have less than £8,000 left to pay of your loan and want to pay it off completely. 3. Mortgage – If you have no other more expensive debt to clear, and you have some money put aside for emergencies, then paying off some of your mortgage is an option. You will need to check your contract to ensure you lender is one of the many that allow up to a 10% over payment without fees. Check when your interest is calculated, if it’s annual and that date has passed then you should put your money into a high rate savings account to earn interest off it until closer to the calculation date. And make sure you have the best mortgage deal as well- if you can switch it could slash your interest payments. Balance transfer credit cards, overdraft credit cards and consolidating your debt into a loan can help you get back in the black, for further advice check out our guide to debt. First we had QWidgets. 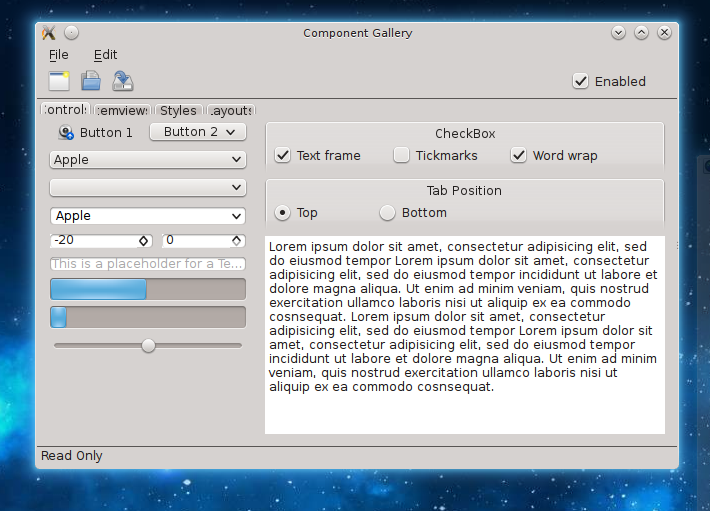 They provided a set of easy to use components that you might put in an application; buttons, text inputs, combo boxes etc. In order to make it look nice, as well as integrate on all platforms these widgets don’t actually do any drawing themselves. Instead they call a lot of methods in the relevant QStyle and ask the style to draw a frames, render some text, tell it how big spacing should be between various parts. There is an excellent talk about QStyles here. Widgets a good for making forms, but they aren’t suited for drawing animations or custom shapes. So Qt has a framework QGraphicsView, which made it easy to render and manipulate pictures, text and shapes at a graphic level. Dealing with all these objects in C++ still gets very complicated quickly, so Qt has a way on top of that to create and manipulate these objects using QML, to give us SceneGraph, which is a new underlying drawing technology which only allows use from QML. QtQuick is a great platform, but we still need a way to draw traditional form components, we need a way to blend into the relevant platform and look like it belongs among the existing apps regardless of the technology used. 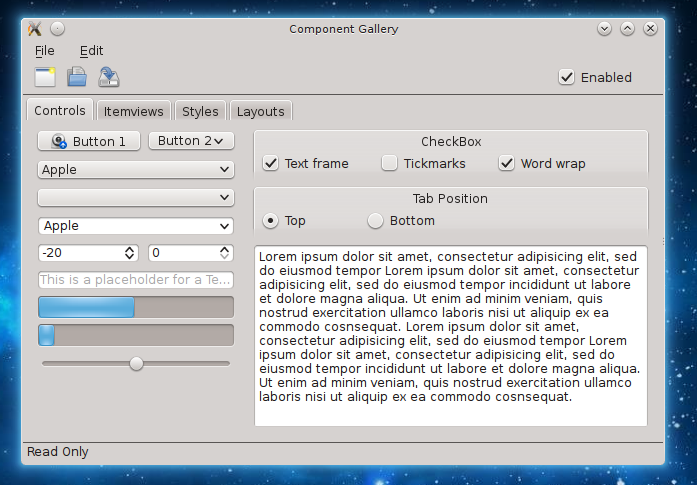 QtQuickControls provide a way to insert buttons, text, combo boxes etc. into your QtQuick application. Like in QWidgets, QtQuickControls do not do all the drawing themselves but instead have a QML powered style API for rendering/theming widgets. This differs from the previous Qt Componenents approach in which platforms (such as PlasmaComponents) would redo all of the internal logic, input handling and drawing themselves. can fetch style hints from QStyle, as well as render QStyle contents (such as frames and backgrounds) into textures that can be used from QtQuick. In theory, if we use QtQuickControls in a QML application and render it in Oxygen, everything will look perfect and “just work”. In practice not so much. The code that makes QtQuickControls use QStyles is undertaking a very complex task and it’s very hard to think about all the different ways a style can be (ab)used to render content. I, with the help of Martin Klapetek and Martin Gräßlin have been working on fixing these issues. A lot of the work has been going upstream into fixing the code in QtQuickControls in Qt itself, with a few patches into Oxygen to help Oxygen know what type of widget it is styling. There are still a few pixels off, but the result is usable for writing widgets or entire applications in QML in a way that fits in with the rest of the KDE applications. Progress can be seen on the tracking wiki page. Due to timescales these changes will not be in Qt5.2.0 but as they are bugfixes, should be in Qt5.2.1. Contact me if you want to help out, in addition it would really help us if someone with a self compiled Qt5 on Windows/Mac can help test our Qt patches to ensure we do not break anything; it will really help up our remaining upstream review requests which have not yet been merged. 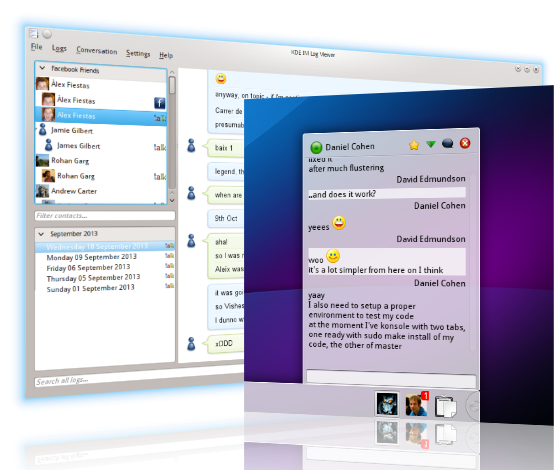 Today we are happy to announce a new version of KDE Telepathy, KDE’s instant messaging client. 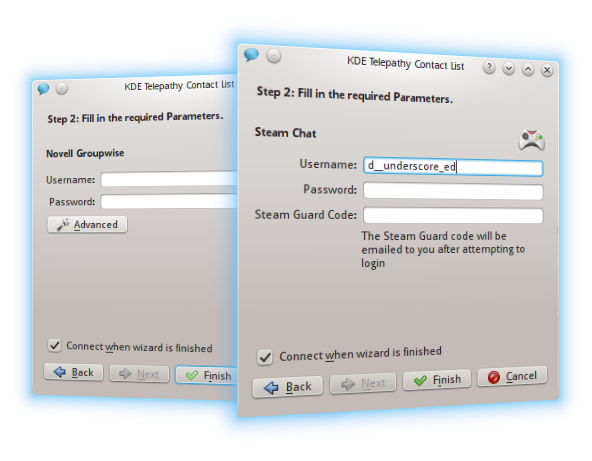 KDE Telepathy is a suite of applications and plasmoids to allow chatting, file transfer, video calls etc (where available). over popular instant messaging networks. Facebook, Google Talk, Jabber, SIP, and many many more putting all your instant messaging in one place – on your desktop. If you have already seen the beta announcement you may as well skip to the end, all the following content is exactly the same. Since the beta we have not added any features but fixed any issues that arose. It’s been a long time since the beta because KTp has a “we do not release until all major bugs are fixed” policy. Hopefully it will be worth the wait. Instant messaging is a constantly evolving platform. There was a time when everyone important was on AOL instant messaging, now that’s unlikely. This evolving landscape is one of the main reasons for using Telepathy as our backend which is used my multiple clients. We not only have our own backends, but can support everything provided by libpurple. We’ve looked at some of the up and coming libpurple backends and added the small amount of code to make everything available. In this release we now support setting up Steam and Groupwise accounts, if the relevant libpurple backends are available. Due to the clever separated architecture of the Telepathy framework, unstable backends do not cause instability in the main application. In addition we are working on developing our own backends, a GSOC student this summer has developed support for sending SMS messages via ModemManager. 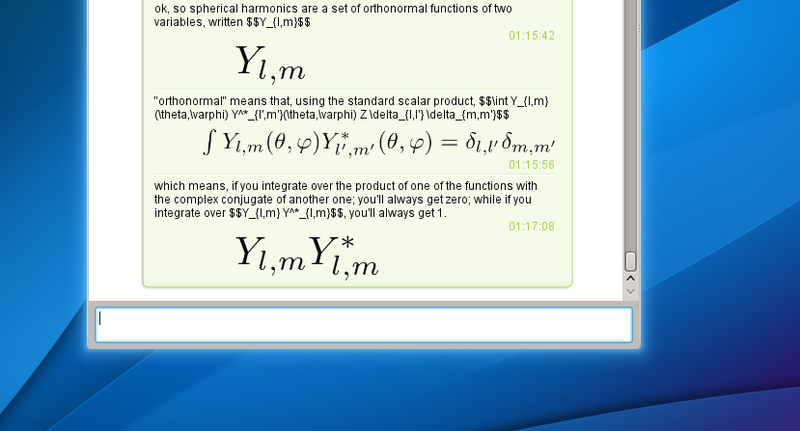 Send LaTeX formula in chats! We’ve ported some of our favourite plugins from Kopete, and now we are able to send LaTeX maths formula to each other, great for when you’re stuck on the class assignment. 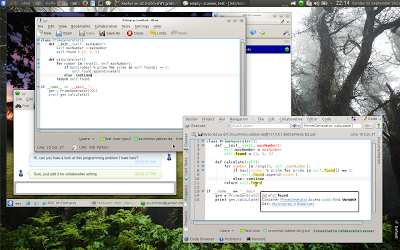 As a Google Summer of Code project, collaborative text editing was added to kde-telepathy. Most prominently, there’s now a “Collaboratively edit a document” button in the chat window, which allows you to edit a document together with a contact without any setup being required (except for you and your contact installing the application, of course). Instead of introducing a new dedicated collaborative editor, this feature integrates with existing KDE applications, such as Kate or KDevelop. 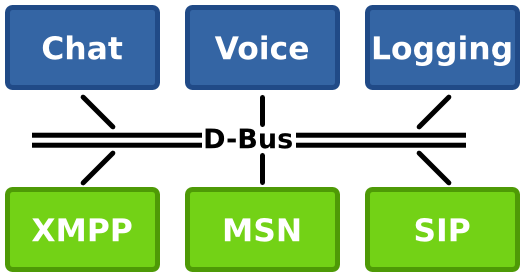 This works by using a technology called Telepathy Tubes, which defines a way to use Jabber to open a TCP connection to a contact in the best most efficient way possible. In most cases, it should use a proxy server, but if a direct connection without a proxy is possible, it will prefer that. If even the proxy does not work, it can also fall back to transferring data directly over the Jabber server, which is a bit slower, but works for every environment. Documentation on how to use and install this feature is available here. A more in-depth announcement of the current release is here. The advantage of using a multi protocol instant messaging client is we are able to show all your accounts in once place. However, this can lead to multiple entries for the same contact across different services. We are now able to join multiple contacts together, we’ve introduced a user-interface that allows you to choose to ignore the technical details and start chats quickly or provide fine-grained control as required. We provide this by adding support for libkpeople – a new system-wide KDE metacontact library aggregating information from all contact sources not just instant messaging contacts but also your local address books, Facebook Feeders, Google contacts, LDAP servers and anything else that provides contacts. Libkpeople works by syncing contact data from all sources into Nepomuk, this means that in addition to grouping instant messaging contacts together we can also interact with data from other sources. We can see email addresses, phone numbers addresses and start a range of actions. As this includes both a Nepomuk dependency and a new library we’ve opted for having two modes, one with the additional features and the other without. If you don’t run Nepomuk you will still have original contact list working as before. In this release we are only adding small subset of new features KPeople is going to provide as it is still very much a work in progress. We wanted to ship this now, to give basic metacontact support setting the buildling blocks for the more advanced features. Note as this is a new library, your distribution may or may not have this supported. In addition to all the new features we have been working on fixing lots of additional papercuts throughout the rest of KDE Telepathy. There have been over 1000 commits since 0.6 and over 300 bugs resolved. KTp 0.7.0 is available at http://download.kde.org/unstable/kde-telepathy/0.7.0/; packages should be available in some of the major distributions shortly. As always we need new developers, we have a lot of exciting new features planned for 0.8. Not everyone is affected at the same time due to a gradual roll out by Facebook. 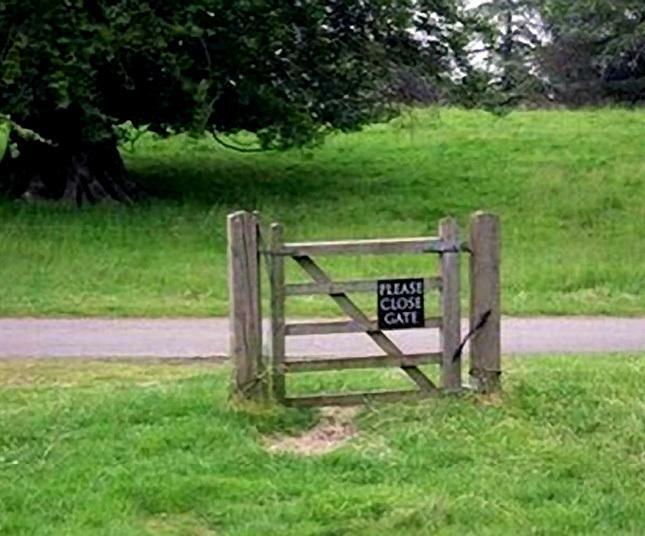 This particular problem is caused by a non RFC compliance in Facebooks XMPP service. In this particular case they are missing a parameter which, whilst required by the specification, is not practically needed. Our library then assumes something is wrong and quits. 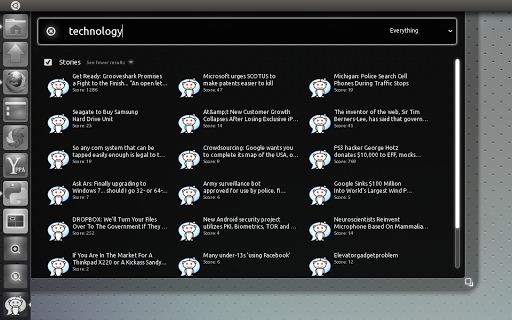 Thanks to help from users at http://forum.kde.org I was able to reproduce the problem. I have added a workaround in the Telepathy Gabble backend to resolve this issue which should fix KTp, Empathy, and other Telepathy users (including the Nokia N9 if they were to make a new release). Other upstream developers helped spring into action to clarify RFCs, add regression tests and backport into 3 different stable releases. It really highlights the importance and advantages of sharing backends. In order to prevent problems like this in the future I am now a member of the Facebook XMPP developer relations group. In addition I now connect to a beta version of the Facebook Chat gateway so we can spot and communicate errors faster. Upgrade telepathy gabble to the latest version (0.18.1) and this problem should go away. Backports are coming soon. Season of KDE is a flexible project to fit around school terms, work, and other commitments, and start and end dates can be discussed with your mentor. Projects should be completed before the end the year, a typical Season of KDE project should take around 2 months. Then head to http://season.kde.org and follow the instructions. It is preferred. Ideally, you should contact a KDE subproject well before applying, ask for feedback on your idea if you have one, and request a mentor directly. 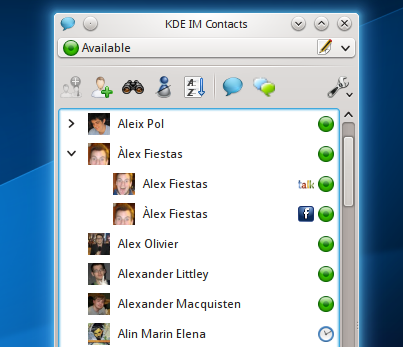 A list of KDE subproject contacts is available on the Google Summer of Code 2013 ideas page. You can also apply without a mentor and we will try to find one for you.